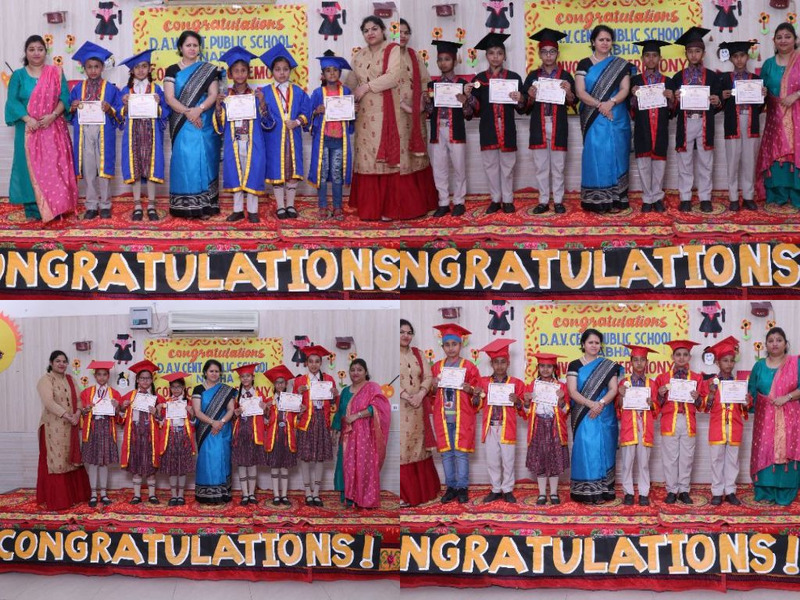 DAV Centenary Public School,Nabha celebrated convocation day to applaud the young enthusiastic learners of the junior wing for their commendable performance in the session 2018-19 under the vigilance guidance of our worthy Principal Miss Meena Mehta on 27th March, 2019. The occasion was graced by many eminent personalities of the city. The ceremony was attended by all the parents of the students from Classes I to V.
The celebration commenced with the chanting of DAV Gaan and the welcome speech by the Principal of the school. The premises of the school was fully decorated. The gathering was then addressed by the Principal highlighting the vision of the school and role of parents and teachers in the students’ learning process. She further emphasized that a school can't progress without the cooperation and interaction of the parents. The most important part of the day was the felicitation of young graduates wherein the delighted students dressed in Graduation robes and caps walked on the stage .The meritorious students were given gold, silver and bronze medals and photographs were taken. The programme culminated with the vote of thanks by the Principal to the parents for sparing their precious time.